The best and brightest teens from all corners of Battleworld are chosen to attend a prestigious school on the planet's capital! But the new class doesn't react so well when they discover that the school's beloved headmaster is actually a diabolical super villain! Final exams are looming at Battleworld's Institute for Gifted Youths - of course, Battleworld's equivalent of a final exam is a brutal deathmatch between students! Faced with harsh lessons and an even harsher truth, the students take to the road - and end up in the Wild West domain of 1872! The Winter Soldier is hot on their tail, but who cares because Molly Hayes totally gets a cowboy hat. Reunions! Betrayals! Maybe some making out! Definitely some death! The Runaways can't run forever, and the end of the road is approaching! 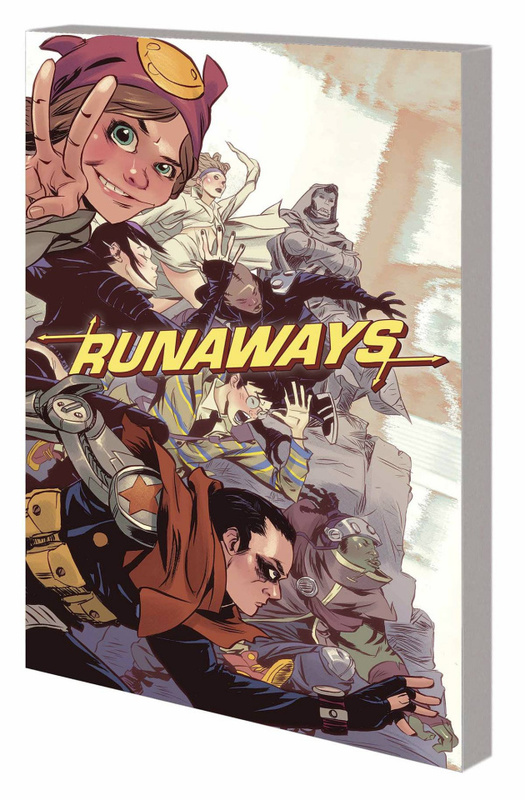 Collecting RUNAWAYS (2015) #1-4 and RUNAWAYS (2003) #1.